How many times did I fail to post something on this blog because I feel like my writing isn’t good enough? I wear the ‘wannabe’ title for so long now. It took that one special person to open my eyes. His soft voice opened the eyes of my heart. It reminds me how I have always been so hard on myself. From my writing down to my body, I was my own worst enemy! Did you know I’ve been blogging for 9 years now? Yes, 9 long years! Not all of them are recorded here on Scoops of Joy but yeah, it’s been a long time and I know I’ve evolved…I found my writing to be more from the heart lately than it ever was. If I were to read my old blog I would probably be way too embarrassed! Even when I got reassuring comment like this one or this one from readers, I still have doubts. I still have moments where I questioned my ability to write, to form sentences that can do my thoughts justice. Sometimes when I read other more eloquent pieces written by bloggers I adore, I wish I could string sentences as good as them. Writing in a language that is not my native tongue, I still make mistakes, grammatical errors and yes sometimes it’s embarrassing, sometimes I got publicly called out on it. I took it hard of course because I wanted to be better than good. My writing has got me through some of the darkest times of my life, it evolve to find the style of writing that suits me, which project who I really am. Finding my voice, my mojo in writing alone has been quite a journey. Writing has gotten me through a lot of stuffs, cathartic even and my love for writing will always be a big huge part of me. My writing is mine alone to share with you and maybe just maybe it would inspire others. Therefore, if you look to the top right section of this blog, you will no longer see my old profile where I plastered “Writer wannabe” label in there. 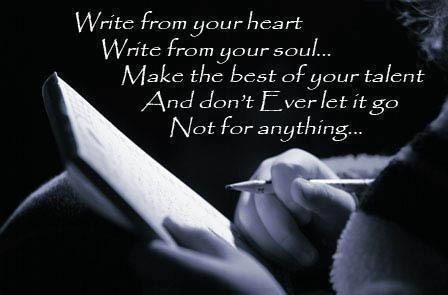 From this day on I will write from the heart. I will continue to practice and I will be writing a lot more. Maybe you will see some of them here, maybe you won’t. When did you realized you are indeed a writer? Katie E recently posted..Is My Son Autistic? Hello girlfriend, you ARE a writer, and I’m glad that YOU finally see it! But I do get it. For the longest time, I did not see myself as a writer, just someone who blogs. Taking the leap to actually put ‘Writing’ in my blog name has freed me in so many ways. Coming from you, who writes beautifully and I totally adore and love your style of writing means a lot! Thank you Alison! Exactly…that’s what I always thought too, “No, I’m not really a writer…I want to be one but for now I’m just a blogger!” Duh! LOL. Your last statement is true, Maureen, as I say in my most recent post. Admittedly it was a shared experience, but I could only write a prosaic piece rather than friend’s poetic, insightful style. Whatever, blogging is writing. The ‘trick’ is to be truthful to oneself, to not plagiarise, so that one’s voice comes through. I agree that it isn’t always easy, but there is a sense of achievement in thinking “that’s it, time to move on” until the next topic presents itself. So, congratulations Maureen on keeping it going for nine years. =) 9 years of documenting life will certainly make you a writer, and a good one in deed. Thank you, Ana. I can’t believe it’s been that long! Hugs to you too my sweet friend! You are definitely a writer. But I’m going through the same. I feel like it’s a process. There’s saying I’m a writer and then actually believing it enough to be confident in my words and phrases. Keep writing, writer mama. To really believe it and to be confident is the hardest part, isn’t? But you are right it is a process and I’m so glad to hear I am not alone 😀 Thank you, Tricia! I think it is so easy so compare our unique writing style to those we view as true writers. We overlook the fact the we each are writers with unique voices. wow –9 years is a major accomplishment in my book –your commitment to writing shows in your work. Believing in myself has been a huge procress –self doubt can be emotionally crippling. Thank you so much, Amy! I am working hard to cast those self doubts away and be positive that my voice is truly mine alone and my stories are waiting to be shared. 9 years is impressive! That’s longer than probably almost all bloggers. It took me a while to call myself a writer because I didn’t think I was good enough. I eventually got over it, because this is what I do – write. I’m glad you got to the point where you could say it, too. It is very impressive you write this blog in a second language as most people would not be able to do that! It sure makes me feel old, Maria LOL. Wow, you have been blogging for 9 years! That is awesome. I just started blogging in January. I am working on my writing skills with my blog. I am going to write my daughter’s story of struggling with a rare form of catastrophic epilepsy called Dravet Syndrome. I enjoyed your post and blog! Nine years is amazing! You have EARNED the right to call yourself a writer!!! I have a question for you though! Have you ever thought of writing in your own language? I wonder if it would be easier for your true abilities and authenticity to be expressed in a language you are organically more comfortable using… Just an idea!! Bless your heart for trying in English! I can’t imagine writing in another language as eloquently as you do! Sigh, I do the same thing. I constantly question why I keep writing, even though the answer is simple – I love to do it. I tend to get so hung up on needing that validity from others that I don’t think of myself as a writer even though perhaps I should. So glad that you’re accepting yourself as a writer! Marta recently posted..The Baby Fever. Yes! I love this! You are a writer! The sooner you own that and your power as a writer, the better off you’ll be! Love this! You have the unique ability to use your native tongue to share beautiful writing and you’re doing an awesome job. Ignorant people concentrate on your shortcomings. Smart people compliment you on your God-given abilities. We all doubt ourselves, but you’ve got to proclaim it out loud and in everything you do. I’m a writer. I’m a writer. I’m a writer. You write beautifully. I haven’t been blogging for nearly as long as you, but I understand the difficulty you were having with calling yourself a writer. I’ve been a writer my entire life, but it wasn’t until I attended a writer’s conference last year that I began to think of myself as an actual writer. And it took several more months, and another writer’s conference, until I finally began believing it. You may enjoy this vimeo. I watch it often because it motivates me to keep myself on a deadline and I’m hoping that by doing this, I’ll close up the gap sooner rather than later. I think we all struggle with this…or at least I do. I feel like if I’m not getting paid to write, then I’m not a “real” writer. I’ve only been blogging for about 6 months now so i definitely still feel that way. It’s funny how we’re so hard on ourselves. Thank you for this post. I’m going to start thinking of myself as a “real writer” starting now! Congratulations on being able to define yourself. It matters. I am also a writer. I know it because when I wake up, the first thing I think about is writing. Thank you for the reminder. Don’t worry about your errors. You will always make them whether they are typos and just not being a native of a language. Enjoy your SITS Day. I needed to read this. I’m still at the beginning of your realization, hearing the voices over and over saying the same (probably true) things about claiming it…. but I still wear the wannabe title. Maybe soon. Good for you! I have felt this way many times. I recently began to embrace my passion for writing through the support of SITS and other blogging communities. Continue believing in your writing. Enjoy your SITS Day, Maureen! Isn’t it awesome to be able to say it and know it? You are a writer. Great post. Happy SITS Day! Tiffany recently posted..I’m So ‘SQUIRRELY’ I Got An Award For It! 9 years is amazing — congratulations! I wasn’t sure I could actually do this…but I just passed the year mark and I have definitely rediscovered a love for writing! Hi Maureen, I am a writer as well. I’m a published author. I also have a blog where I dispense writing tips and writing exercises. You are more than welcome to come and visit and use anything you find there to help you with your writing. Have a blessed day! I have only been blogging for about 7 months and still have a difficult time referring to what I do as blogging. What is blogging anyway? I also don’t call myself a writer but everyone who has ever read my writing has told me that I write beautifully and encouraged me to write, so I created my website to write about my life. It seems most of the blogs I read fit into some niche like health, exercise or recipes; so I feel like I don’t fit in with the blogging community. My blogs tell my story and I enjoy reading blogs that tell personal stories. I look forward to reading yours. 9 years is an impressive amount of time to be a blogger. So happy to hear you proclaim you are a writer. Good luck to you and Happy SITS Day. Good for you on 9 years! I don’t feel like I’ve yet earned the right to call myself a writer, but I’m definitely on my way. Good for you on claiming that status. Happy SITS Day. What a wonderful and heartfelt post! I definitely have issues with this exact subject… Maybe now I’ll rethink the “labels” I give myself and admit it – yes, I AM a writer! I’m still not sure if I consider myself a writer. My brother and sister-in-law are journalists – they are writers! I still think of myself as an accountant who blogs. I’m working on the confidence thing! By the way, English is my first language and I make grammatical mistakes all the time! Anyone who ignores the heart and soul of your posts, looking for mistakes in grammar is a sad soul. Keep up the great writing!